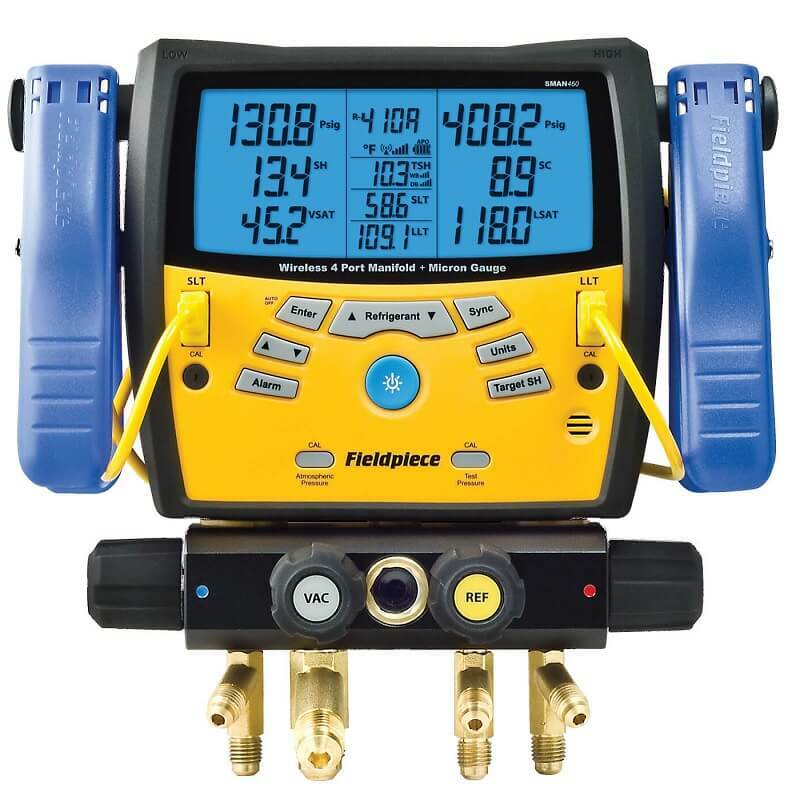 Fieldpiece SMAN460 4-Port Wireless Digital Manifold with Micron Gauge is a top of the line instrument that comes with built-in vacuum gauge with alarms, stopwatch, and rate indicator, and it calculates target superheat and subcooling to increase efficiency of work. The Fieldpiece comes with more features to create more meaningful results. Backlit display shows all measurements for easy and meaningful diagnosis. Built-in 45 refrigerant library can be updated via mini USB, when new refrigerants are available. Built-in micron gauge with alarms, stopwatch and rate indicator to improve work efficiency. Simultaneous measurements of superheat and subcooling. The SMAN460 has been designed and built to create meaningful results for easy to understand diagnosis and to increase job efficiency. The Fieldpiece digital manifold with 4 ports it built tough to withstand harsh environments, and comes with padded carrying case. The built-in micron gauge has a range of 50 to 9,999 microns to cover all possible scenarios. A technician can even set alarms at given micron level, so he could keep working while pulling vacuum. A HVAC specialist can also use other measurement units, such as: Psig, kPa, MPa, bar, inHg, and cmHg. The backlit display shows all results at the same time improving understanding of existing problems and cutting down on manual labor. The menu of instrument is intuitive and easy to follow. The important feature of SMAN460 is performing simultaneous measurement of superheat and subcool temperature. 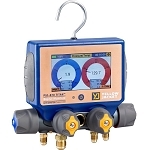 The SMAN460 digital diagnostic manifold automatically calculates target superheat using measured values, thus eliminating both additional manual work and guessing. 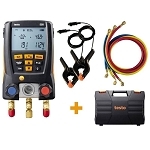 The Fieldpiece SMAN series is unique, as it has an ability to perform linear adjustment of the pressure sensors linked to refrigerant type, temperature and pressure right, when you are on a job site. 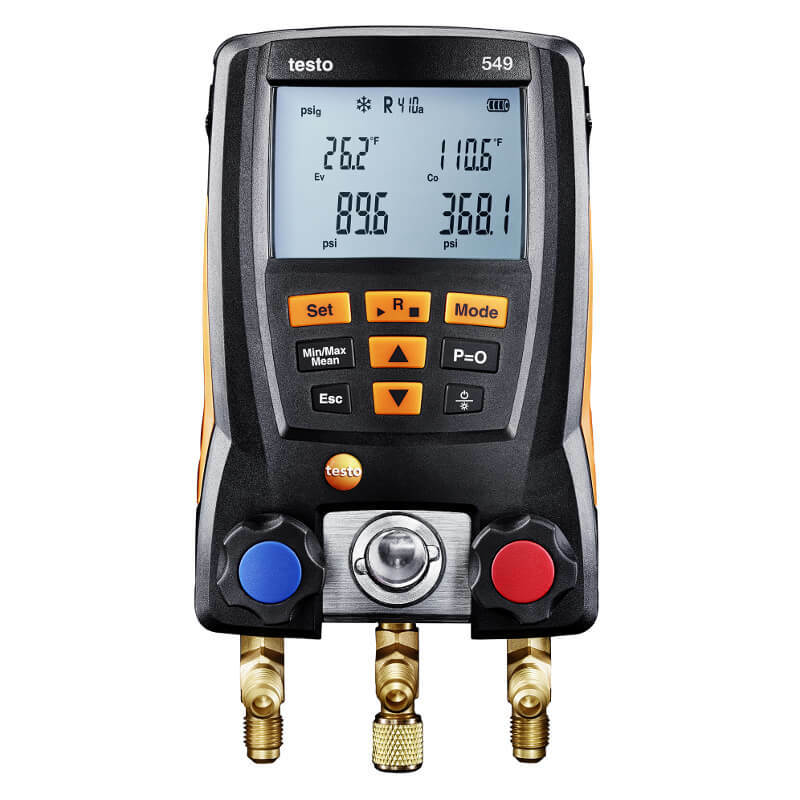 Working with SMAN460 any technician can maximize efficiency of A/C or refrigeration unit faster than with any other digital manifold. Large 3/8 inch bore and VAC port are ideal for pulling vacuum in the ac system, as they accommodate bigger vacuum hose. This fourth port is what makes SMAN460 so useful in the field. 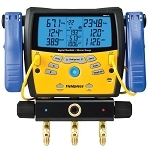 The wireless communication on this digital charging manifold supports live real-time measurement adjustments, so you can see live data on your mobile device. Moreover, when coupled with JL2 job link mobile system transmitter, you can see readings from SDP2 dual in-duct psychrometer in the mobile system app. The app also give you an ability for thorough system diagnostics, report emailing and cloud storage of your data. We recommend using Fieldpiece SMAN460 due to it’s innovative design, multiple features, easy to understand menus and accurate readings. Note: All accuracies are after a field calibration. I'm not gonna try and break it, but this manifold can take quite a few accidental beatings. Definitely worth the price, especially for the all in one screen measurement display. 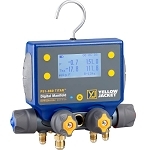 This digital manifold makes your life and job easier and saves you so much time when you need to adjust systems. This is the same unit that they used to call the SMAN4. 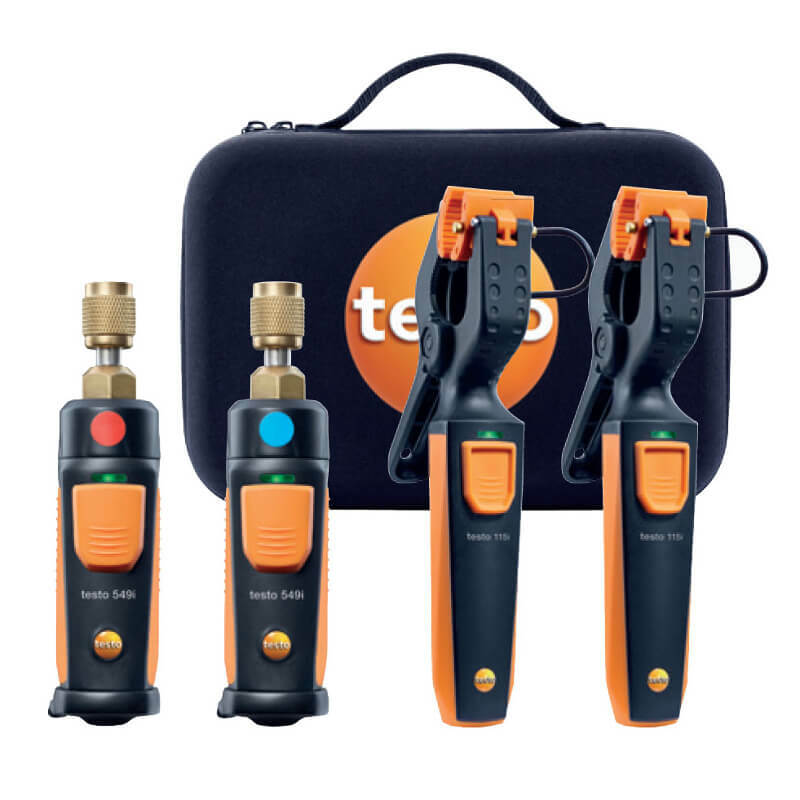 Built in vacuum, tons of refrigerants in it already, superheat and subcool automatically, and actually more durable now that they changed it a bit. All around an awesome buy. I don't know why someone would hold out buying a digital manifold. They only thing i can think of is that the price is still a little high. Give it a few more years and i bet prices will decrease dramatically as the install base sky rockets. Good ole supply and demand. They are awesome and save a ton of time on site. What are you waiting for? This manifold is extremely pricey compared to non-digital ones, but it's well worth because having all of the measurements on one display is very convenient and saves a lot of time. This is the newest version made from Fieldpiece. It works great and the screen displays all relevant measurements at the same time. Makes my job a lot easier to have everything at my fingertips. This is an awesome digital gauge set that I saw a coworker using and decided to pick up. You can connect all your hoses at once and all the values are displayed onscreen at the same time so you can balance the system in one shot. Saves tons of time and effort. Worth every penny. Someone said it was expensive, so I had to counter that. You have to consider all pros and benefits like huge and expandable library of refrigerants, built in micron gauge, not to mention wireless communic'ation. Oh c'mon, you can do all diagnostic work, plus recover and charge ac system, so it cannot cost five bucks. To me, this is the best ac digital monifold in US. 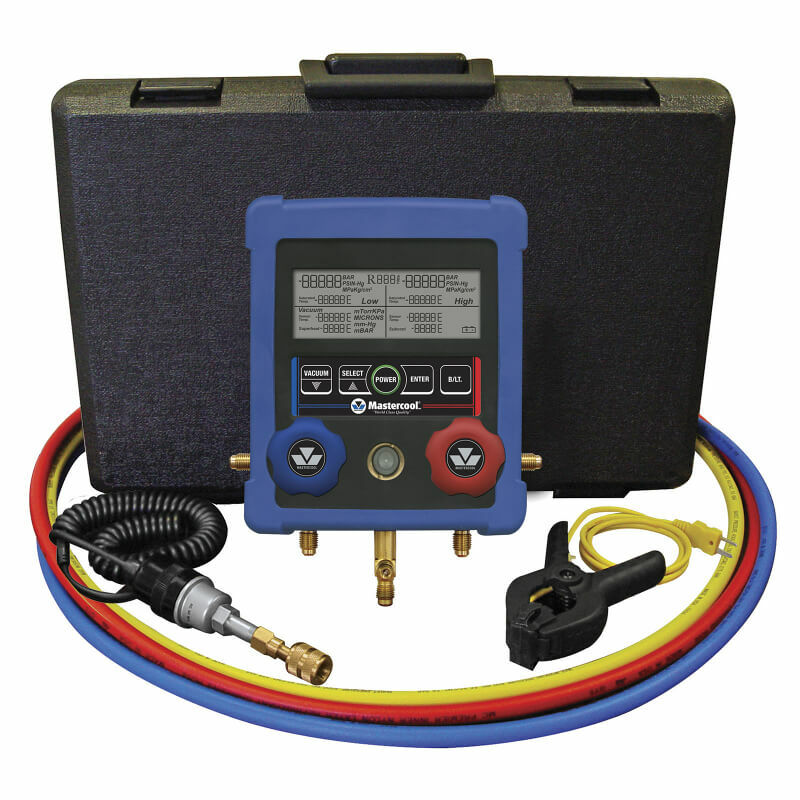 A: Hello, the SMAN460 is not recommended for use with propane or butane based refrigerants, but otherwise can be used for automotive ac systems. Q: Can this be used with 410a gas? A: Yes, this manifold is compatible with 410a.